Your marching orders for battling the culture of death in America! Listen to Created Equal’s weekly pro-life current events podcast with your host and long-time front-line activist, Mark Harrington! On September 15, 2017 four pro-lifers conducted a "Red Rose Rescue" at Northland Family Planning Centers abortion mill in Sterling Hts, MI, namely Will Goodman, Matthew Connolly, Abby McIntyre and the director of Citizens for A Pro-Life Society, Dr. Monica Miller. The rescue was part of a NATIONAL INITIATIVE. On that day of rescue, two other "Red Rose Rescues" took place in Alexandria, VA and Albuquerque, NM. The rescuers in Michigan faced a maximum of THIRTY DAYS IN JAIL and/or a $250.00 fine. The six person jury FOUND THEM GUILTY OF TRESPASS and sentenced them to TWO YEARS OF PROBATION. The American Freedom Law Center intends to file an appeal. WATCH BELOW as Mark Harrington INTERVIEWS THE RESCUERS right outside of the courthouse where they received their verdict and sentencing. The goals of the Red Rose Rescue are two-fold: 1) to PERSUADE WOMEN TO LEAVE abortion centers before entering, and by doing so give life to their children; and 2) to SHOW A DEFENSE OF THE UNBORN scheduled to be imminently put to death--insofar as the pro-lifers expect the abortion procedures to not take place as long as they maintain a presence in the abortion facility. Dr. Monica Migliorino Miller explains: "Our goal is to reach out to the women scheduled for abortions. Ours will be the last voice they will hear to encourage them to turn away from the violent act of abortion--a violence against them, and against the innocent unborn who have no one to speak for them. We are there to help these moms, but we are also there to abide with the innocent unborn scheduled to be aborted--knowing that as long as there is a pro-life presence in the abortion centers no abortions will take place and the unborn thereby defended." Miller explains: "One of the reasons we decided to do the Red Rose Rescue at Chelian's Northland Family Planning in Sterling Heights was that her remarks indicated a shocking lack of respect for women." 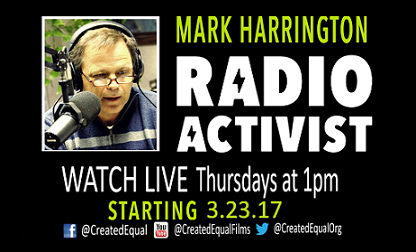 You can watch The Mark Harrington Show LIVE every Thursday at 1pm ET on Created Equal Facebook, Twitter and YouTube accounts. If you can't catch him live, you can subscribe to Mark via podcast to listen any time! Copyright Created Equal 2019. All rights reserved.